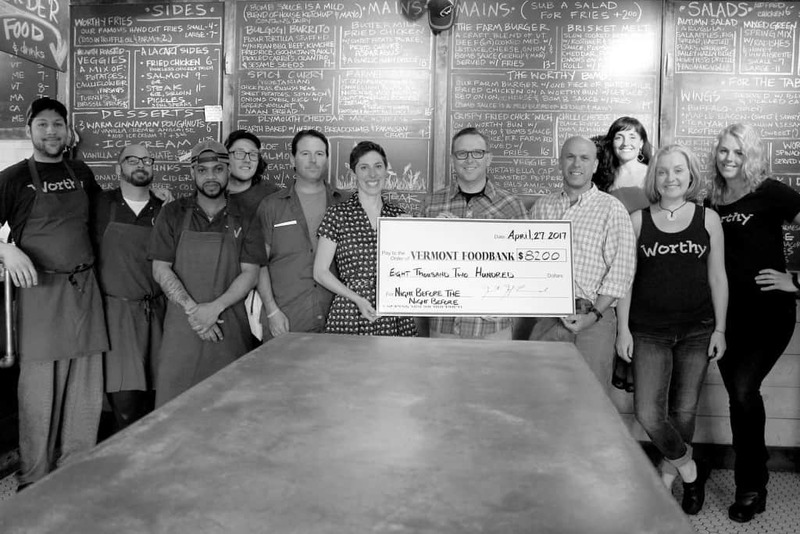 WOODSTOCK—On May 10 the staff of Worthy Kitchen, a craft beer and farm diner in Woodstock, presented the Vermont Foodbank with a check for $8,200 to fight hunger. This donation is the result of their annual Night Before The Night event. For five consecutive years, Worthy Kitchen has brought people together to share a meal, enjoy an exceptional beer list, and bid on silent and live auction items to benefit the Foodbank. The silent auction features an array of 60 artistic, creative local items, products and services from local businesses committed to ending hunger. The $8,200 raised this year marks a record-setting donation for the event. The event attracts a significant following because of the fixed price farm to food offerings and the many rare beers featured. “This was a wonderful opportunity for our kitchen staff to really show their stuff and get creative and explore new flavor combinations,” adds Kurt Lessard, CFO of the Worthy Group. In the past five years, the Worthy Kitchen has raised more than $26,000 for the Vermont Foodbank. The staff of the Worthy Kitchen presents the Vermont Foodbank with a check for $8,200.